NSAI, SONA, and NMPA are asking YOU to help us in the last stage of determining who will run the collective to administer your mechanical royalties beginning January 1, 2021, as set forth in the Music Modernization Act. The US Copyright Office is currently seeking comments to help guide their decision! This is a competitive process and it will be important for the Copyright Office to hear from songwriters who support the industry consensus MLC proposed by NSAI, SONA, and NMPA. I am __________________, a songwriter from _____________________. [short explanation of who you are, your background and the music you write]. 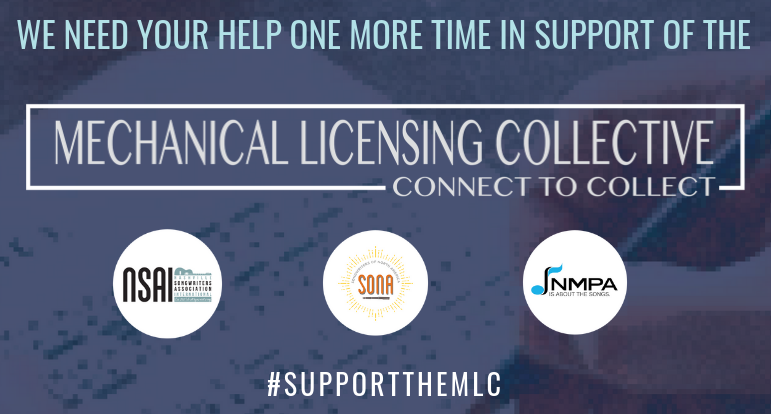 I write to you today in support of the Mechanical Licensing Collective (“MLC”) submitted by NSAI, SONA and NMPA on behalf of songwriters and publishers to be the collective. The MLC was created by copyright owners and those entities who worked so hard to bring the MMA into being. The MLC is inclusive and its Board of Directors and Committee members include my peers, respected and qualified songwriter and publisher representatives with the experience and passion to carry out the mission of the collective. I have confidence that the MLC will do the best job in licensing and collecting digital mechanical royalties for songwriters and publishers.